Apple's CEO has emerged as a major diplomatic voice for the tech world, seeking to calm relations between the U.S. and China, a new report says. 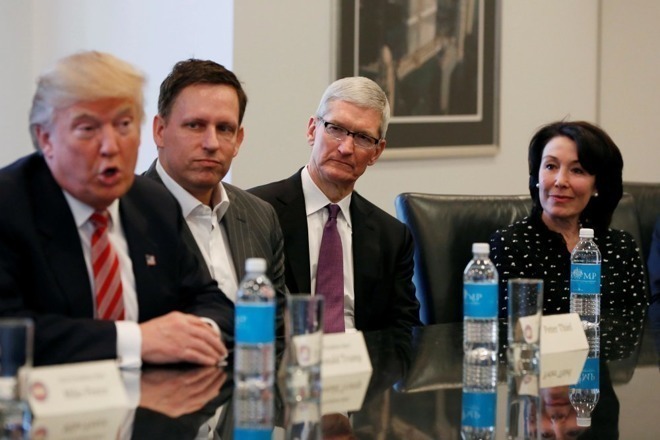 According to a New York Times analysis published Monday, Tim Cook, in the Trump era, "has had to act a lot like the tech industry's top diplomat." For example, Cook recently met with Trump in the Oval Office on April 25, and called for "calmer heads" at a summit meeting in China the month before. The Times reported for the first time that the administration has promised Cook that even as tariffs on Chinese goods move ahead, the U.S. government will not extend those restrictions to iPhone. It also reported further on Cook's meeting with Trump, which involved economic adviser Larry Kudlow and consisted mostly of the CEO praising last year's tax reform law, while also lobbying the president against a trade war with China. The story does not clarify whether the no-iPhone-tariffs promise came in that White House meeting or at another time, nor whether it was delivered to Cook by the president himself or by someone else in the administration. Interestingly, Cook has found cabinet members in the Trump administration more accessible than their Obama era counterparts. In particular, the Apple chief has agreed on issues with Treasury secretary Steven Mnuchin and, to a lesser extent, commerce secretary Wilbur Ross, the report said. In addition, the Times detailed Cook's itinerary on his March visit to China, where he met with multiple senior figures in the Chinese government. Apple's attempts to cozy up to Chinese leadership has been nicknamed "Red Apple" by employees at Apple supplier Foxconn. Apple's efforts are essentially focused on maintaining close ties with both governments and avoiding trade-related acrimony, which Cook and other Apple leaders consider bad for business. China, throughout Cook's tenure as CEO, has become more and more important to Apple, both for supply chain reasons and because of the importance of China as a market. Also in the Times piece, it's noted that the president has repeatedly told crowds that "Apple [plans] to build multiple factories in the United States. Apple has no plans to do so and has not publicly corrected him."